Many of us are familiar with the basic concepts of CPRbut may not be as familiar with BLS. This article will explore both procedures so that you are familiar with the difference between BLS and CPR and have a better understanding of what each entail. CPR, or Cardiopulmonary Resuscitation, is performed on people whose hearts have stopped beating. It is a good way to keep a person alive while waiting for medical emergency teams to arrive. To perform CPR, one must compress the chest while blowing air into the mouth to keep the heart beating and to keep blood flowing through the body. This increases the person’s chance of survival and minimizes the risk of brain damage that can be a result of a loss of oxygen. CPR is used in events when a person stops breathing. It is effective in dealing with cardiac or respiratory emergencies like a drowning or drug overdose. It can also be used to open airways in choking victims when the Heimlich maneuver is not helping. CPR can be administered to infants, children and adults. However, for children and infants, a different protocol is involved. This is because children are less likely to need CPR for cardiac incidents and more likely to need it for respiratory failure or poisoning. Also, because children’s bodies are more fragile chest compressions should be performed by using the fingers rather than the palm of the hand. BLS, or Basic Life Support, is a more advanced life saving procedure. It is administered by public safety professionals, first responders, healthcare providers, paramedics and qualified bystanders. It is given to someone with a life-threatening illness or injury and can improve their chances of survival until they get to a hospital. It is typically used on someone in cardiac arrest or respiratory distress. BLS involves three main components. These include an initial assessment, airway maintenance, and breathing and CPR. In order to perform CPR or BLS safely and efficiently, it is important to take classes to get a certification. A CPR certification will be a good first step to getting your BLS certification. A BLS certification includes CPR trainingbut it is more intensive and complex. Like CPR training, becoming BLS certified involves learning how to maintain an open airway and ensuring blood and oxygen keeps circulating through the body. However, there are more in-depth practices involved. Here you will also learn how to administer oxygen, the team approach to CPR and advanced airway management techniques. CPR is a great thing to learn if you work with children or are a football coach or lifeguard. However, if you are looking for a career in the medical industry, BLS certification is advised and may even be necessary. CPR and BLS are both valuable skills to learn. However, not many of us have time to attend classes. Online CPR certification and online BLS certification are great alternatives for those of us who lead busy lifestyles. Online certification will allow you to learn life saving techniques at your own pace and at the location of your choice. Because the material is online, it can be reviewed as needed. It is a great way to learn these valuable skills while working around your hectic schedule. It is important to keep your knowledge of CPR and BLS fresh in your mind, especially if you are not in a profession where you need to practice these skills every day. That is why the American Red Cross requires a re-certification course be taken on a regular basis. CPR certificates are valid for one year before a re-certification is needed and BLS certificates are valid for two years. Both CPR and BLS certification renewal is available online. In fact, most online courses will send out reminders to let you know when renewal is due as an added convenience. 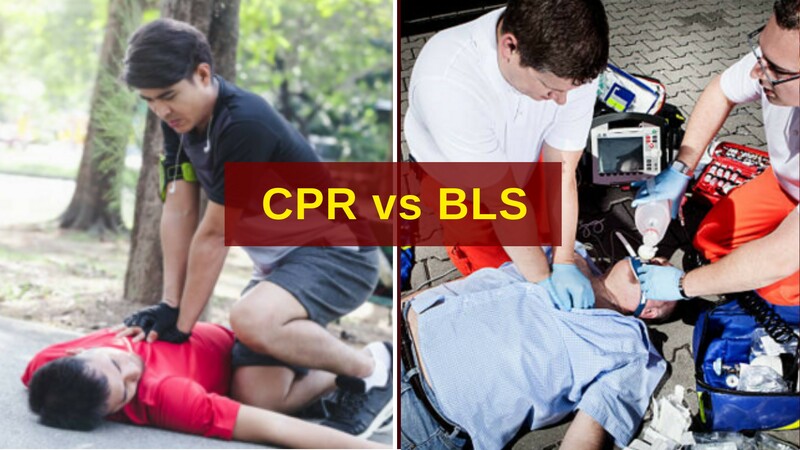 So, to summarize the difference between BLS and CPR, BLS involves a more extensive curriculum of training that includes CPR but also goes beyond it. While CPR is recommended for those whoselife-saving skills could come in handy in their profession, BLS is more suited, and often required for those who work in the medical field specifically. In any case, these are both valuable skills to learn and something everyone can benefit from knowing. We encourage you to find out more about these procedures and who knows, maybe one day you could end up saving a life.